It’s been a very good season for the Eclipse Motorsport TVR thus far, but John Griffiths (below) was naturally a little reluctant to predict the outcome of this one – not wishing to upset the Gods who are in charge of reliability. Things do go wrong with racecars, but on this occasion, the timing of the only problem all weekend was just about as perfect as it gets. 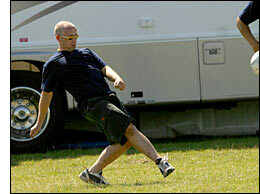 Between the sessions, the mechanics fitted in a knockabout football game – mad dogs and Englishmen etc….nice looking side foot though Micky! The 30 kg of ballast bolted to the floor on the passenger’s side was a handicap, but Piers was still second fastest of the GTO runners in Qualifying – but only fractions ahead of the Rollcentre Mosler, the CDL TVR, the Master Motorsport Ultima and the Peninsula TVR. Sunday’s race was looking as though it could be a classic. As things turned out, it actually wasn’t, but we can hardly blame Shane and Piers for outdriving their rivals behind. Before that though, there was the raceday warm-up, and already there were signs that the Rockingham crowd was going to be a monster one. By lunchtime, 44,000 spectators had flooded into the track, the biggest crowd yet seen at this marvellous facility. The car was loaded into the transporter – all the easier to get at the clutch – and sure enough, in good time for the start (lots of hours later – the last race of the day), it was rolled out with a perfectly operating clutch. Shane to start – and he got off to a good one, running third behind the pole position Balfe Mosler and the GT class Blower Motorsport Ultima. The latter wouldn’t be a factor, because as a more powerful car, it had a compulsory two minute pit stop. 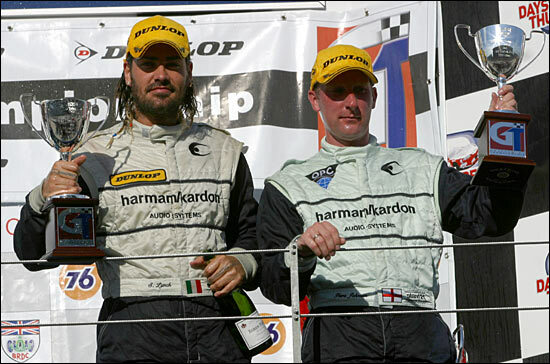 So Shane was third, but in reality second – to the Balfe Motorsport Mosler, which was passed by the silver Ultima. And that’s where Shane stayed, although he did drop back a little as his stint progressed. 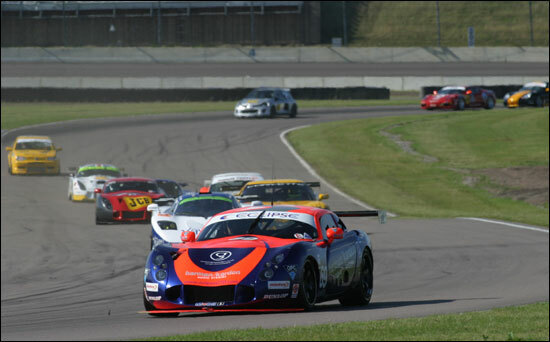 The rest are seen dropping away from the TVR, below. He and Jamie Derbyshire pitted after 21 laps, and Piers emerged closer to #33 than Shane had been at the end of the previous lap – the gap was seven seconds. 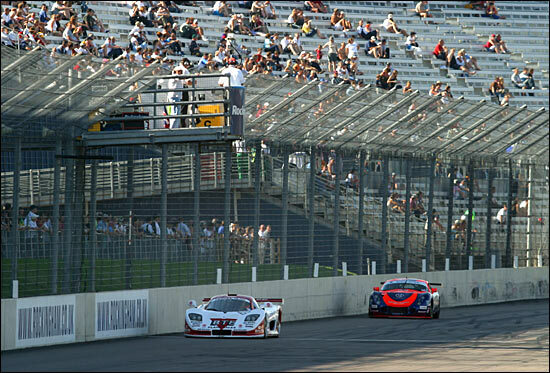 “But we knew we weren’t a match for the red Mosler,” said a very hot Piers Johnson after the race. “The guys were giving me the gaps back to the other Mosler behind.” But Piers and Shane were more than a match for any other driver/car combination - hence the lack of a threat from behind. 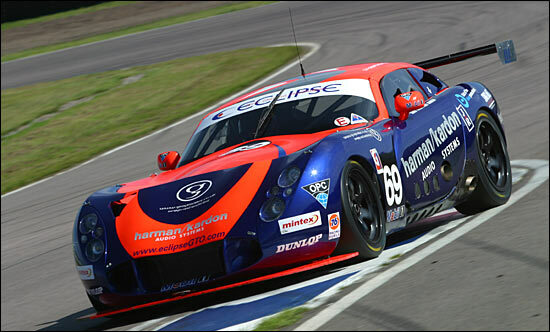 Whether one or both Moslers will be Eclipse’s main championship rivals at the end of the season remains to be seen, but having started the race five points behind Tom Herridge in the blue one, the fact that the #69 TVR beat it home means that the gap is now just two points – with three races left. At 7pm, Shane was spotted ambling across the (by now largely empty) car park with his runners-up trophy - and climbing into a blue Ford Transit….with GARDA written down the sides. What will he turn up in at Thruxton on August 16/17?